Do you struggle with creating social media content on a regular basis? You aren’t alone, which is why we are here to help! 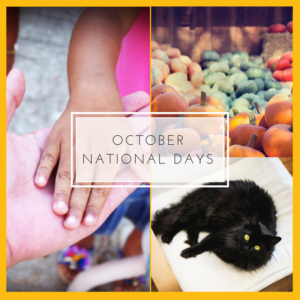 October is right around the corner and the national days are plentiful next month! Don’t miss out on opportunities to connect with other like-minded fans through your branded social media content celebrating the following days! Boss’s Day (or National Boss’s Day) – Annually Oct. 16 unless it falls on a weekend. Then it’s the closest workday. WOW-there are a LOT of days there! Which ones will you be celebrating? My favorite ones tend to be the food days! I love any excuse to enjoy my favorite foods! Although I’m pretty sure I don’t need to celebrate Moldy Cheese Day on October 9th. YUCK! Another way to maximize the exposure that National Days can provide is through creating new ways that your business can celebrate special days. For instance, October 28th is Make a Difference Day. I love the idea of making a difference, big or small! This is your chance to get creative in how you celebrate and how you connect with clients. Lorrie has often said that marketing is the act of building awareness, connecting, communicating, serving, supporting…all to make sales. National Days are an easy way to make your marketing count!